NVDA is one of the hottest semiconductor stocks today. After rising more than 1600% since 2013, the stock still continues to surprise many by going higher. Well, if I set a price target I think it will be a big mistake. Just imagine the people who put a price target of $200 and expect it to go down from there. NVDA's stock price proved them wrong as is traded above $238. The chart above is the daily chart of NVDA. As you can see, the stock is in a nice daily uptrend. The drop below its 50 MA in December 2017 caused some concerns. Around that time I remember that certain people were very bearish about the stock. Yes it had a nasty correction but it found support around the $185 area. The stock soon formed what we call an ascending triangle pattern and broke out of the pattern to go higher. The stock also went back above its 50 MA. A healthy stock will not fall below its rising 50 MA for long. 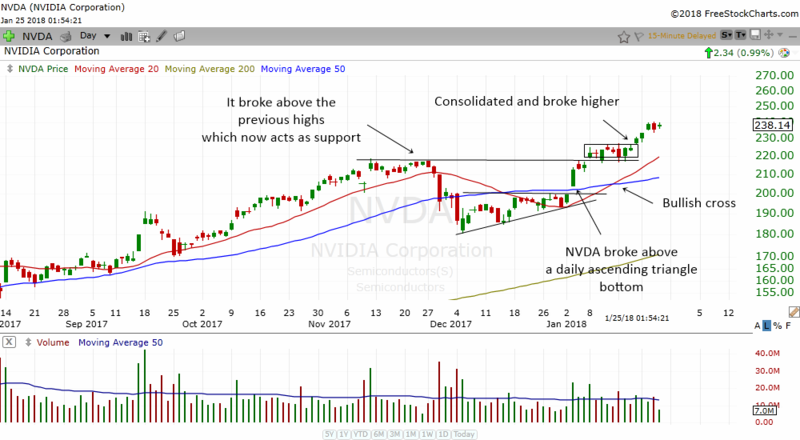 NVDA continued to move up and broke above its previous highs. As some of you are aware, a previous high once broken will now act as support. What was once resistance now becomes support. NVDA consolidated for a while at support and then broke higher. 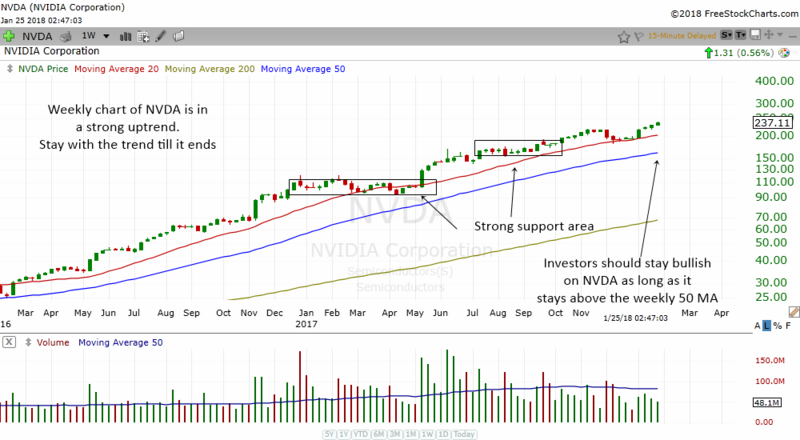 At this moment, if NVDA continues to stay above the support area, the stock is very likely to continue to move up. The trend for the stock is up and there is ample support below. The stock is trading above its rising 20 MA, 50 MA and 200 MA. This is an indication of a strong uptrend. There is a bullish 20 cross 50 MA lately. The last time the stock had a bullish cross was in May 2017. Since then the stock has moved up by more than 80%. Well if history can repeat itself, NVDA might continue to move up by quite a lot. The chart above is the weekly chart of NVDA. NVDA is in an extremely strong weekly uptrend. It has stayed above the weekly rising 20 MA and 50 MA most of the time. Investors should continue to be bullish on this stock when it is staying above the rising 50 MA. You should not worry too much about a nasty big drop as there is lots of support below. The boxes I have drawn are long term support area. Back when NVDA had a recent correction, one member in my US Market Trading group asked me if NVDA was overbought. I had a bullish bias on NVDA because it was hitting the weekly rising 20 MA. You see, when the weekly trend is up, the odds of the stock moving higher is very good. As a trader, we need to pick spots in an uptrend to buy the stock. Either through buying the dips or breakouts or continuation patterns. 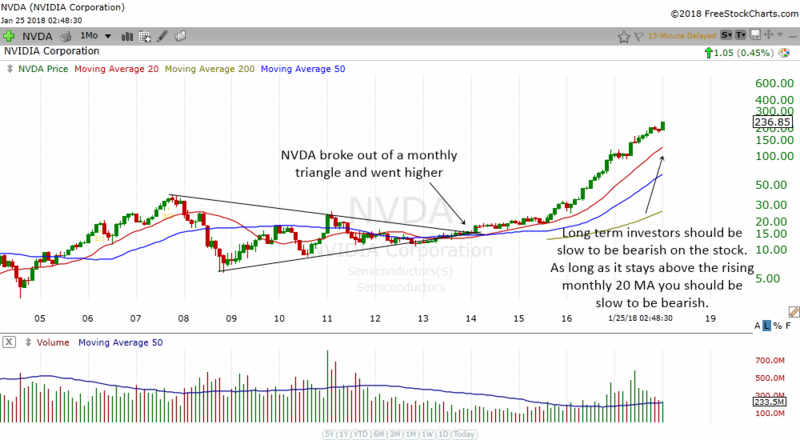 Last of all, let us look at the monthly chart of NVDA. This stock had broken out of a monthly triangle and moved up from there. Chart patterns are very beneficial even in long term charts. Since the trend is up, very long term investors should still continue to be bullish on this stock. Stay with the trend till it ends. Don't worry too much. As long as NVDA stays above the monthly 20 MA, the odds of it moving higher is very good.